For free concert tix to the Milwaukee Police Band annual concert, please contact the band office at 414-935-7933 or contact us via this website under "contact". 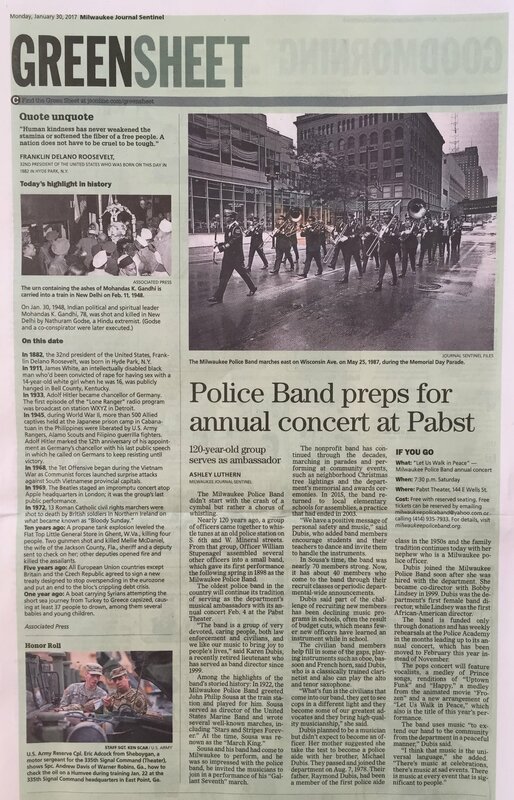 The Milwaukee Police Band was included in the Milwaukee County Historical Society "Melodies and Memories, 200 Years of Milwaukee Music" Exhibit in 2017. Below: Assistant Chief Harpole, Director Karen Dubis and Milwaukee Metro Singers Director Trefor Williams after the concert at St. Sebastian's Church to benefit the Meta House. Tree Lighting for the Garden District Community on Tuesday, December 6, 2016 was windy, brisk but delightful! Thank you to all who attended and sang along with the Milwaukee Police Band. Tree Lighting in the Third Ward on Friday, December 2, 2016 for the 19th year for the Milwaukee Police Band. Holiday Parade 2016 was about ready to start as some of the band members wait together on Saturday, November 19, 2016. During the 2016 Holiday Parade, we negotiated 30 mph winds. (See article below with photo of Retired P.O. Kathy Gorlewski, the drum major of the band. Milwaukee Police Band performance on Sunday, August 21, 2016 at the Peck Pavilion in Milwaukee. Milwaukee Police Band vocalists Carolyn Tillman, Carrie Moore, Kerri Jokala, and Shannon Smikowski. Milwaukee Police Band vocalist Carolyn Tillman. Milwaukee Police Band vocalist Daryl Ratliff. Milwaukee Police Band vocalist Shannon Smikowski. Performing "America the Beautiful" are John Michalski, Jim Hutchinson and Daryl Ratliff. Represent the Milwaukee Police Department and serve the community by providing music, education, and goodwill while preserving the historical importance of the band. The Milwaukee Police Band's primary objective is to build strong and mutually trusting police/community relations using the universal language of music. The police band is comprised of both sworn and civilian members as an example of the outreach by the band with the community. 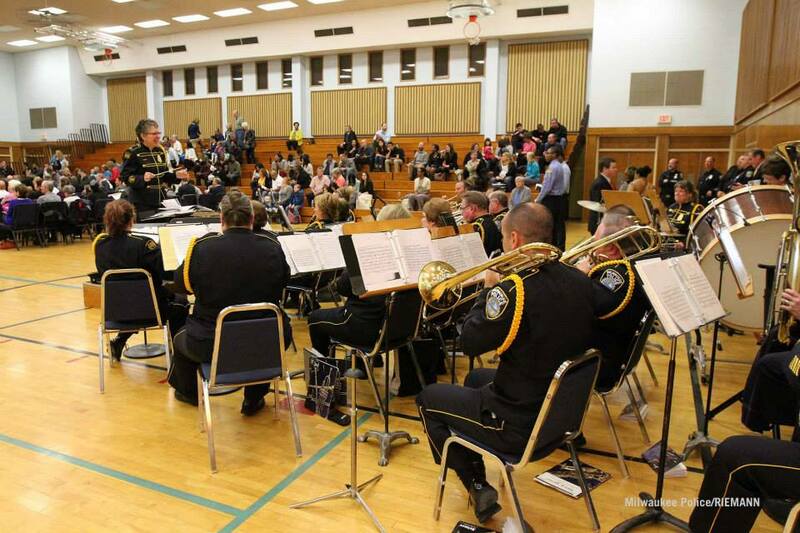 The Milwaukee Police Band performs regularly at many events throughout the year to include the Annual Fall Concert, the Police Officers Merit Awards Ceremonies, Recruit Graduations, Police Memorial, Holiday Parade, Third Ward Christmas Tree Lighting, Special Olympics Opening Ceremonies and more. The following are highlights of some of the performances of the band over the past year. Come join us live at the Peck Pavilion at 929 N. Water Street on Sunday, August 21, 2016 at 2:00 p.m. for a Sunday afternoon concert. This is the first time ever that the Milwaukee Police Band has performed at this facility. This is a free concert open to the public. The band performs at all of the departments Merit Award Ceremonies for department members and citizens of the community. On May 11, 2016, our Trombone section was shown on the Channel 12 News that included Police Officer Mark Kubicek, Retired Lieutenant Michael Schmitz and Donald Taylor. On Saturday, May 7, 2016, the members of the MPB performed at the opening ceremonies for the Special Olympics in the greater Milwaukee area. The band led the parade of athletes around the track. Police band members, Officers Carrie Finley and Pam Looney playing their clarinets. Both officers have been long time members of the band. The members of the police band have formed a smaller breakout group called the "Bluecoats" that travel to schools in Milwaukee to interact with the children and youth. The band members convey a message for personal safety as well as positive contact with police officers that they meet. The band performed on March 15, 2016 at the Hopkins Lloyd Community School at 1503 W. Hopkins Street. The students participated in many portions of the concert including playing percussion instruments along with the band. Great students and teachers! On April 19, 2016 they performed at the LaFollette Elementary School at 3239 N. 9 Street. The Bluecoat band members performed on February 23, 2016 at St. Gregory the Great School at 3132 S. 63 Street and the students were fabulous! McGruff the Crime Fighting Dog also makes an appearance with the band. On January 28, 2016, the Milwaukee Police Band performed at the Graduation of the latest class of police officers at the Police Academy, 6680 N. Teutonia Avenue, Milwaukee. On Tuesday, November 10, 2015, the Milwaukee Police Band "Bluecoats", a breakout group of police band members, returned to performing at elementary schools. The first school chosen for this performance was the Bethune Academy at 1535 N. 35 Street. Police Band Member James Hopper sharing his sousaphone with a student from Bethune Academy. Retired Sergeant Bill Randall as McGruff the crime fighting dog talking to the school children at Bethune Academy about personal safety. The band after their annual fall concert November 7, 2015. This is a free concert performed for members of our community. Milwaukee Magazine chose the Milwaukee Police Band to be featured among other entities as one of the "Reasons to Love Milwaukee" and listed them in the October issue in 2015. The Milwaukee Police Band participated in the fair parade at State Fair Park on Sunday, August 9, 2015. Please listen in on the interview with Director Karen Dubis conducted by radio announcer Dori Zori of FM 88.9 in Milwaukee by clicking on the recording below.